The Aurora Branch Primary celebrated the 24th of July, or Pioneer Day, every year. 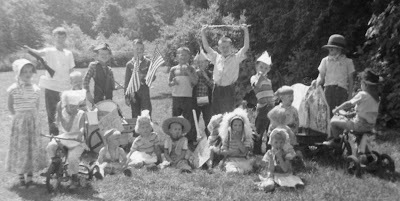 In 1957 and 1958 the children dressed up as pioneers and Indians and paraded around the picnic ground on Mastodon Lake Island at Phillips Park. 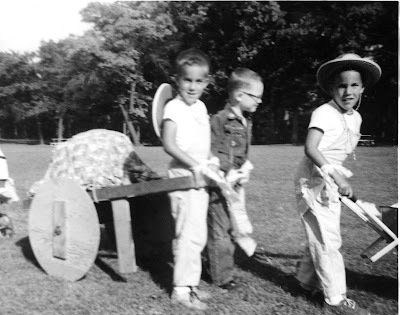 “For some must push, and some must pull…” Reality matched the lyrics in 1958 when Doug Fisher and Doug Erekson pulled their handcart and Dean Fisher pushed his wheelbarrow. 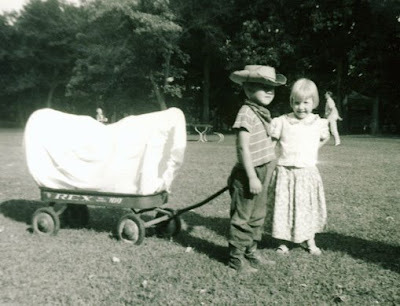 Also in July 1958 Randy Erekson and Dottie Sullivan were ready to pull a covered wagon across the plains. 1957: Wearing a crepe paper bonnet and apron, Kathy Sullivan looks a little weary from the long march holding an 1847 sign. 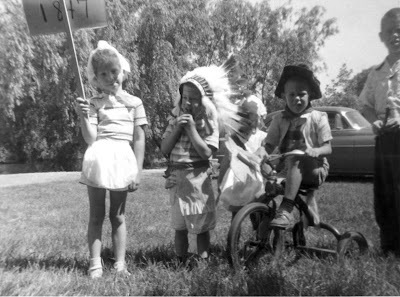 With her are Stephen Doty (Indian chief), Karen Doty (probably), Paul Doty (riding a tricycle), and Bucky Spahr. The Aurora Branch Primary in 1957. Can you help me identify the ones I don’t know? Standing: --girl in bonnet?--, John Resch, Cris Erekson, Tom Erekson, --?--, Billy Spahr, Erek Erekson, Bucky Spahr (arms raised), Tommy Spahr?, --boy in hat?--. Front: --tricycle/possibly a Boswell?--, Debbie Doty, Margaret Sullivan, -- Boswell?, --hidden--, Stephen Doty, -- girl in front?--, --back to camera?--, --boy?--, Paul Doty on tricycle. In the early 1950s Primary was held in various homes; the Ereksons, Greers, and Spahrs are the ones that I remember. In 1956 Grandma [Myrtle] Greer became Primary president, and we began to hold Primary at the Odd Fellows Hall on Tuesday afternoons from 4:30 to 5:30. In the summer, however, she moved Primary to Phillips Park, where she would reserve the Bird House, a large enclosed pavilion with picnic tables. This had the advantage of being rent-free and the disadvantage of being rather distracting for children who were expected to be reverent in a park. Thanks to a history of the Aurora Branch Primary, 1932-1961, that I found at my parents' house, we know that the Primary presidency for September 1956 through August 1957 consisted of Myrtle Greer, president; Pat Boswell and Mary Jane Greer, counselors; Gladys Sullivan, secretary; Kathleen McGuire, historian; chorister, Mary Jane Greer. The Primary Presidency changed in 1957-58: Myrtle Greer, president; Mary Jane Greer and Gladys Sullivan counselors; Lucy Doty, secretary; Elinor Woolcott, historian.